Finally, after a long discussion over the deal, Flipkart board has approved an agreement to sell 75 per cent equity to Walmart for $15 billion. Amidst the speculations of exits of co-founders of the SoftBank-backed e-commerce marketplace, the proposed deal seems to be final now. According to a Bloomberg report, SoftBank is going to sell over 20 per cent stake in Flipkart at a valuation of $20 billion. Besides, Google parent Alphabet is also likely to participate in the deal. SoftBank has already given the green signal for the deal. And as per earlier reports, the Japanese internet and investment conglomerate will get an exit of $4 billion for its $2.5 billion investment in Flipkart eight months ago. The development also puts an end to the long thread of Amazon’s repeated efforts of acquiring a controlling stake in Flipkart. Last month it offered a break-up fee of $2 billion to the Bengaluru-based company and recently it made a formal offer to buy a 60 per cent stake in the online retailer. The proposed deal may take 10 days to complete and the financial details may get updated by the end, the report added. Meanwhile, Flipkart has bought back $350 million worth of shares from its investors as it seeks to convert its Singapore-incorporated company to a private limited firm. The move will further ease the way in for a new strategic investor. The deal has also triggered multiple speculations in the media. 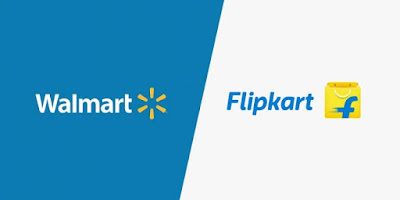 While co-founders of Flipkart reportedly willing to sell their stakes and may take an exit from the company, Google’s entry in the Flipkart-Walmart deal will take on Amazon’s supremacy in India. Google and Walmart have already made a huge dent in US market. Both forged a partnership in the US last year where Walmart products are sold on Google Express, the tech giant’s online mall. Google also offers personalised voice shopping for Walmart products online. Additionally, customers can place orders for Walmart products by speaking them out to Google Home devices. Walmart customers have the option of linking their accounts to Google. If the deal in India gets fructify according to present scenario then Google and Walmart will replicate their business synergies in India on the lines of the US.